The Office of Residence Life promotes community and student development by creating a highly supportive, integrative environment of learners that enriches the overall collegiate experience of residential students. Through collaborative programs and services within the Division of Student Life, the department will provide life-enriching opportunities that foster the intellectual, social, emotional, and personal growth and well-being of students. The main office is located in Washington Hall. During the academic year, office hours are from 8:30 am to 6:00 pm Monday through Thursday, and 8:30 am to 5:00 pm on Friday. Over the summer, office hours are reduced to 8:30 am to 5:00 pm Monday through Friday. Please click here for the Summer Intern Housing Application. We hope you had a great semester living on campus! Are you staying late this semester or staying for summer housing? Please make sure you complete the forms below for these requests. 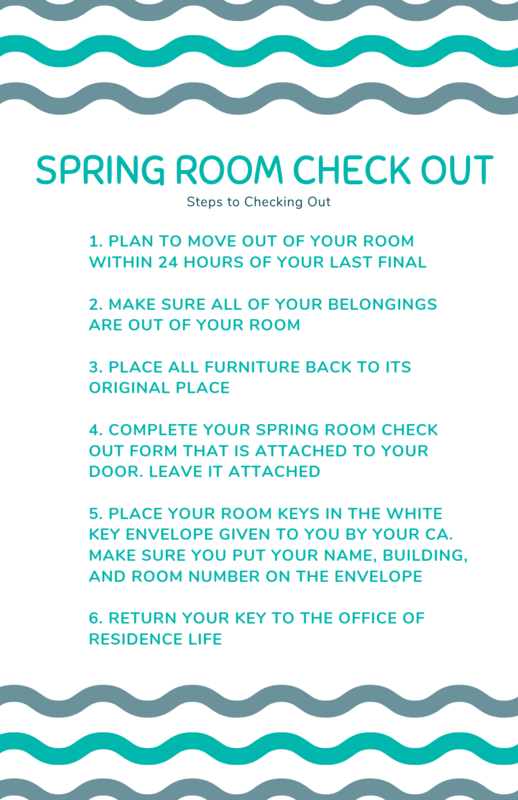 Also review the information about checking out of your room this spring. Making plans for next year? Do you need to arrive early for the fall 2019 semester? To make sure your room is prepared for the fall you must submit your early arrival request before July 18, 2019.